The accounting firm of Price Waterhouse was hired to count the ballots, after the fiasco of prematurely-leaked voting results in 1939 by the Los Angeles Times. Therefore, the year 1940 was the first year that sealed envelopes were used to keep secret the names of the winners. In fact, this was the first year in which the winners remained secret until the moment they won their awards. It brought about the famous phrase: "May I have the Envelope, please." A new category was added: Writing: Original Screenplay. Independent producer David O. Selznick, who had produced the previous year's big winner Gone With The Wind (1939), also produced the Best Picture winner in 1940 - and campaigned heavily for its win. 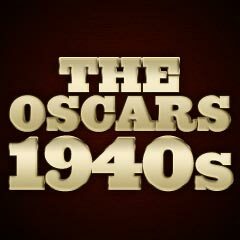 Selznick was the first to produce two consecutive winners of the Best Picture Oscar. Rebecca was based on Daphne du Maurier's popular novel about a shrinking, child-like bride (Fontaine) who lives in the shadow of her enigmatic widower husband's (Olivier) first wife at a somber estate named Manderley (run by a mad, steely-eyed and devoted housekeeper (Anderson)). Although Rebecca had eleven nominations, it only won for Best Picture. The film's studio - United Artists - was the last of the original film studios (the others were MGM, Columbia, 20th Century Fox, Warner Bros., Universal, and Paramount) to win the Best Picture Oscar. 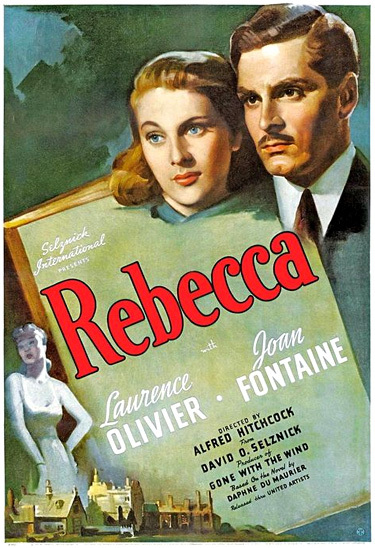 Rebecca was the first American-made film directed by British suspense master Alfred Hitchcock. James Stewart, after making 24 films over a five year period in Hollywood, won the Best Actor award (with his second nomination - it was his sole Oscar win in his entire career) for his performance as Mike Connor - a young Spy Magazine reporter sent to cover the marriage of a socialite (Katharine Hepburn) in The Philadelphia Story. His award was seen as compensation for his loss the previous year for his performance as Jefferson Smith in Mr. Smith Goes to Washington (1939). Ginger Rogers never won an award for her best-remembered dancing partnership (she had performed in nine musicals with Fred Astaire by 1939), but the dark horse did win (with her sole career nomination and Oscar win) the Best Actress award for her dramatic role in the classic 'woman's picture' Kitty Foyle as the title character/heroine. In an adaptation of Christopher Morley's novel, she starts out as a white-collar working girl who becomes a businesswoman and is forced to make a romantic choice between a rich, married Philadelphia socialite and a lower-class young doctor. After she loses a baby son, she decides to strike out alone. Walter Brennan won a Best Supporting Actor award (it was his third nomination and his third award in five years) for his performance as the notorious Judge Roy Bean in love with Lily Langtry (Lilian Bond) in director William Wyler's The Westerner (with three nominations and one win). Brennan was the first performer to win three Academy Awards - an unprecedented record he held for twenty-eight years until Katharine Hepburn won her third Oscar in 1968 for The Lion in Winter (1968). The Best Supporting Actor winner was nominated only once more in the next year - for Sergeant York (1941) - but he lost the award to Donald Crisp. Though the Best Supporting Actress award could have gone to Australian-born actress Dame Judith Anderson (with her sole career nomination) as the sinister, malevolent housekeeper Mrs. Danvers ("Danny") who dies within the flames of Manderley mansion in Rebecca, it was awarded to Jane Darwell (with her sole career nomination) for her outstanding, memorable portrayal of strong and understanding earth-mother and migrant farm worker Ma Joad in an adaptation of John Steinbeck's The Grapes of Wrath. Preston Sturges won the first Original Screenplay Award for the political screwball comedy spoof The Great McGinty (the film's sole nomination and award) about city hall graft, Sturges' directorial debut film. Walt Disney's animated Pinocchio won the Best Original Score and Best Song Awards (for "When You Wish Upon a Star"). Unbelievably, Cary Grant was also snubbed and not even nominated for his role as divorced, but dashing, colorful, pompous, playboyish husband C. K. Dexter Haven in the screwball comedy The Philadelphia Story. Although The Great Dictator, Chaplin's first all-talking, all-sound film received five nominations: Outstanding Production/Picture, Best Actor (Chaplin), Best Writing (Original Screenplay) (Chaplin), Best Supporting Actor (Jack Oakie) and Best Music (Original Score) (Meredith Willson), it went away empty-handed. Although James Stewart was successful in the Best Actor category this year, he was not nominated for another great role in The Shop Around the Corner - co-stars Margaret Sullavan and Frank Morgan (as the tormented store owner) were also overlooked.